Breast tissue density is an important risk factor in the detection of breast cancer. It is also known that interpretation of mammogram lesions is more difficult in dense tissues. Therefore, getting a preliminary tissue classification may aid in the subsequent process of breast lesion detection and analysis. 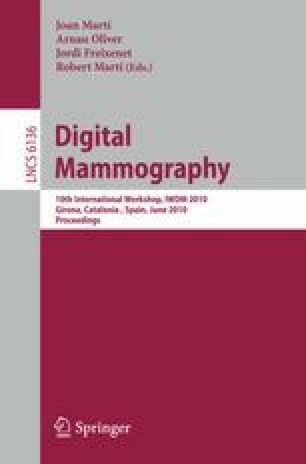 This article reviews several classification techniques for two datasets, both digitized screen-film (SFM) and full-field digital (FFDM) mammography, classified according to BIRADS categories. It concludes with a hierarchical classification procedure based on k-NN combined with principal component analysis on texture features. The results obtained classifying 1740 mammograms reflect up to 83% of samples correctly classified. The method is being integrated within a CADe system developed by the authors.